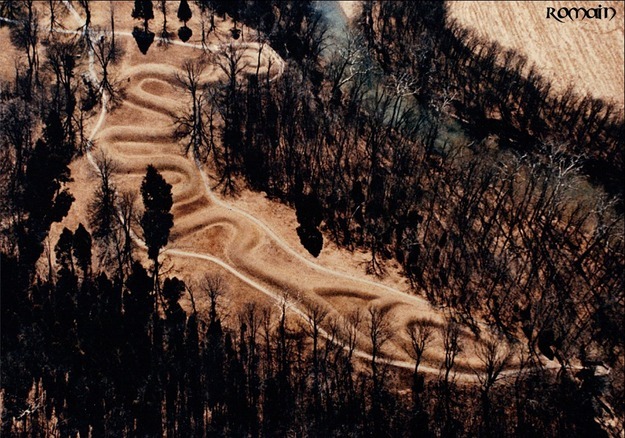 Recent scientific investigations have revealed that the Serpent Mound was probably built by the Early Woodland (Adena) people around 321 B.C. The Mound had previously been thought to have been built around A.D. 1070 by the Fort Ancient people. Turns out the mound had been built much earlier, and probably repaired by the Fort Ancient people around 1070. 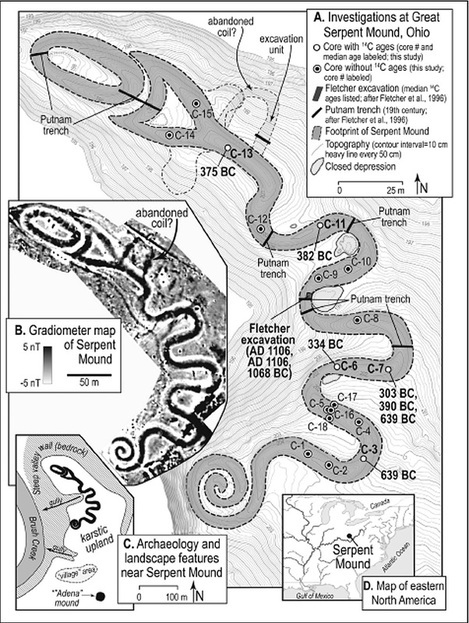 Interestingly, a recent gradiometer survey of the mound revealed an abandoned coil of the serpent near the head. The coil was totally removed from the site but evidence of it was still seen beneath the soil. The abandoned coil is seen on the gradiometer map above. The map on the right show the cores recently made that indicate radiocarbon dates next to them. The coil was probably eroded away after it was built since it was on the slope of the edge of the hilltop. Perhaps it was later removed when the mound was repaired. These are important findings since they date the Serpent Mound at roughly the same age as nearby sites such as the Chillicothe Mounds and Newark Mounds that are being considered for designation as United Nations World Heritage sites. 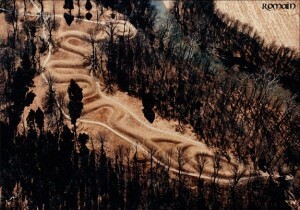 Serpent Mound may therefore be included as part of a World Heritage Site.